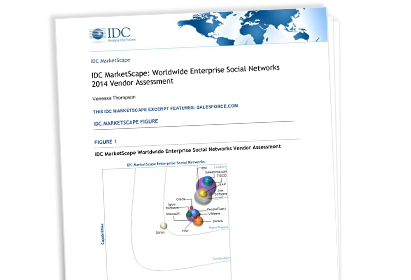 IDC names Salesforce a leader in social enterprise markets. Learn how the market for enterprise social networks has changed dramatically in the past two years, with a broad transition from a focus on standalone solutions, to platforms that allow social workflow to be embedded across enterprise systems. This IDC Report examines this market transition and outlines the key reasons why Salesforce is leading the way in enabling both internal and external social collaboration across organizations. IDC reports that the Salesforce platform has become the primary interface to integrate with other major enterprise applications. So employees, customers and partners can easily collaborate and access information, from any application, anytime, and anywhere.